were announced at Supreme Session in Cincinnati, Ohio. The McHenry Award is an honorary award for the Ladies of the Household who have made a contribution to the Foundation of either a minimum of $5,000.00 in cash or the equivalent value of assets. Through their efforts they have supported the mission of the Foundation by actively being involved in the fundraising activities at the Shriners Hospitals for Children®, their Temple or though the Foundation, educating the public as to the mission and vision of the Foundation, educating the members of the Daughters of the Nile as to the mission and vision of the Foundation , and /or initiating philanthropic endeavors that provide for the needs of patients of Shriners Hospitals for Children through the Foundation. 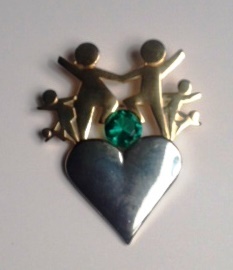 and the corresponding pin with a green colored gem stone to signify they are McHenry Award recipients.